Posted by Stuart Herbert on May 5th, 2010 in M4 Motorway, Modern, Morganstown, Photos, Shoot. Shot from the bridge that crosses high above the M4, this photograph embodies much of what my Merthyr Road project means to me. 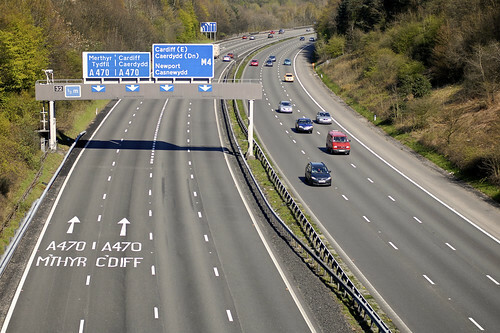 You’ve got the junction offering two choices: head north towards Merthyr Tydfil, or head south towards Cardiff. Both routes take you along the A470, today’s Merthyr Road. But in the past, your choice would have been the same, but the routes you would have travelled would have been so very different. Posted by Stuart Herbert on February 27th, 2007 in Cardiff Railway, Glamorganshire Canal, Historical, M4 Motorway, Merthyr Road, Pentyrch and Melingriffith Light Railway, Shoot, Taff Trail, Tongwynlais, Walking Routes. View these photos as part of my Merthyr Road set on Flickr. Or, if you prefer, view a map with everyone’s photos taken in the same area. Although many folks around here know about the remains of the old Glamorganshire Canal preserved at Forest Farm, I doubt that many folks know that there’s still a small stretch of the canal still in existence by Tongwynlais, cut in half by the M4 motorway as it heads west from Junction 32 and the Coryton Roundabout. The route down from Tongywnlais along the Taff Trail and then back to Tongwynlais via the Coryton Roundabout makes for an enjoyable – if very muddy! – circular walk that can be done in an hour or two. Page 144 of the award-winning The Glamorganshire and Aberdare Canals – Volume 2 by Stephen Rowson & Ian I. Wright (ISBN 1-903-59912-1) has a photograph of a steam train crossing a bridge at Middle Lock. The note accompanying the photograph states that the remains of the bridge still exists beside a section of the canal cut off by the M4 to the north and the Forest Farm Industrial Estate access road to the south. I was out to find and photograph this section of the canal. Either last year or the year before, Kristi and I cycled the Taff Trail from Taffs Well down to Cardiff and back. At no time did we realise that there were any remains of the old canal nearby; we certainly didn’t know that at one point our path took us to within 100 yards of a surviving stretch. You can actually see the stretch on this Google map. The Taff Trail comes south down Iron Bridge Road, under the A470, and then turns north-west (right as you look at things) following Iron Bridge Road around a local playing field. However, after emerging from under the A470, if you turn south-east (left as you look) instead, the path beside the picnic area leads straight to a section of the canal, I’d say no more than 200 yards from where you emerge from under the A470. This section runs maybe 3-400 yards in length before disappearing underneath one of the slip roads for Junction 32 of the M4. At that point, you’re forced to turn west, and follow the embankment down to the River Taff and back to the Taff Trail. (When you get to the Taff Trail, it’s well worth turning right and heading north up the Taff Trail a short distance to the Iron Bridge. Alas, there’s no plaque that I could find to provide any details about the bridge, but it does afford a good view of Castle Coch in sunny weather). The section of the canal to the north of the M4 seems to be completely invisible on the satellite view on Google Maps. But what is still visible is the clear outline of a railway embankment running north west beside the canal. If I have my bearings right, this is part of the old Cardiff Railway which once ran up to the coking plant at Nantgarw – and is just to the north of the bridge and canal section that I was out to track down on this shoot. The old railway line is (at first) impossible to trace on Google Maps as you move south of the M4. The trick is to go to the other end – Coryton Station in Cardiff (where the line ends in this day and age), and then follow the route of the old railway west by north west back up to Long Wood Drive. (The old railway line makes for a nice walk too; I’ll be covering it in a shoot later in the year when we have blue skies once more). Between Long Wood Drive and the M4 lies the remains of the railway bridge that once crossed the Glamorganshire Canal at Middle Lock – the railway bridge from the photograph in the book. How to find it? As you head south on the Taff Trail from Iron Bridge, you pass under the M4. The Taff Trail continues straight ahead (almost due south) along the bank of the River Taff. There’s another path immediately heading off to the left. Take the path to the left, and follow it along until it ends at another path (which runs west-east along the north side of Longwood Drive – not that you can tell when you’re actually on the walk!) Turn left, heading pretty much due east back towards Coryton Roundabout. The path takes you straight to the section of the canal mentioned in the book, right before it climbs up to the Esso petrol station and the Asda supermarket. The remains of the bridge can be seen to the north of the path, and to the left of the surviving stretch of the canal. To be honest, there isn’t much to see. This stretch of canal is much more overgrown than the section by Iron Bridge Road, although it doesn’t appear to be anywhere near as silted up. The retaining wall that the bridge must have sprung from can be clearly seen, but nothing else remains at all. Still, I got a bit of a thrill from seeing such a well-hidden remnant of the past – especially as about 100 yards to the south lies the northern end of the Glamorganshire Canal Local Nature Reserve, which is much more frequently visited (probably because it’s nowhere near as overgrown). I’ve already made one (very short) trip to the Glamorganshire Canal Local Nature Reserve; I need to make another visit before I have enough photos to publish as a complete shoot. To complete the walk, leave the canal by the path that leads up the steps, and follow the path around the north side of the Esso petrol station. This path takes you over a footbridge onto Coryton Roundabout (which is fun to explore), and out the other side over another footbridge back to the A4054 and into Tongwynlais. Although all the paths in this section of the walk are modern and tarmac, I managed to lose my footing at one point – a combination of muddy boots and water running down the slope of the path. Once you’re off the roundabout and back in Tongwynlais, you should be fine. Overall, the walk’s easy going, with no major inclines to worry infrequent walkers. There’s one set of steps immediately after leaving the canal, and the paths are muddy at this time of year. You get to see two surviving sections of what was once one of the most important canals in the whole United Kingdom, and the early heart of the industrialised South Wales Valleys before the trains took over, plus the remains of a bridge that used to carry one of those railways up into the valleys. That’s not bad for a Sunday stroll. Although the photograph of the Iron Bridge has quickly become the most viewed photograph from this shoot, I personally prefer this photo. Although it was hardly difficult, I’m still pleased that I managed to find some remains of the bridge that I set out to find on this walk. Further up the valley, there are many places where there isn’t a single trace of the canal or the bridges that used to cross it. Don’t get me wrong – the A470 makes a huge difference to folks like me who live up in the valleys – but there hasn’t been any noticable effort (apart from the Nantgarw Pottery) to preserve at least some memory of the industrial heritage of the 1800’s. Maybe even these few remains will be gone within my lifetime; it’s nice to have a record of what’s there today in case they’re gone tomorrow. Although I originally wanted to pick out specific photography techniques from each shoot, the truth is that I don’t pay all that much attention to technique when I’m out and about. I mind the basics – shutter speed vs focal length for sharpness and aperture for depth of field – and then forget about them. The section has never lived up to its “Three Techniques” name, so from now on “Three Lessons” it is. Instead, I’ll be posting regular mid-week articles on individual photography techniques, which will include technical skills (starting with weening off automatic mode), ideas about composition, and the workflow I follow for getting my photos from the camera through Aperture and up onto Flickr. A separate article will allow me to really get into a single aspect of photography, which will help me learn a lot more about photography. If you’re going out and you’re likely to be photographing water, don’t leave your polariser behind. *Cough* I did, and I’m still kicking myself for doing so. On the bright side, it means that I’ll have to go back later in the year (preferably when all the mud has dried out …). If the sign says go one way, try going the other. As I mentioned in the introduction to this article, I’ve been down part of this path before, but I had absolutely no idea how close I was to the old canal. I need to rethink the way I’m organising my photos in Aperture. I’ve decided that I hate keywording all of my photos. Even with creating a metadata preset before doing the import, it still takes hours to go through each individual photo and apply the right keywords for that individual frame. I don’t have that sort of time, so I’ve stopped keywording photos in Aperture, but I still manually tag photos on Flickr. 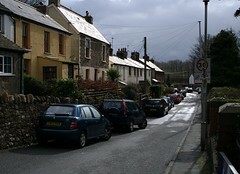 Instead, my photos go into a Merthyr Road project in Aperture. This project is divided up into several folders based on geography – Taffs Well to Treforest for example – and each folder contains an album for each major subject, such as the Glamorganshire Canal or the Cardiff Railway. The only problem is, of course, that I’ve ended up with several Glamorganshire Canal albums and several Cardiff Railway albums. As the number of shoots racks up, I’d like to be able to look at all my Glamorganshire Canal photos in one place so that I can see how my coverage is doing and what gaps I need to think about plugging in future. I can’t do that with the way I’m organising my photos in Aperture today. Aperture supports Smart Albums – albums that can automatically pull in photos based on their keywords. I think I need to restructure my Merthyr Road project to make the most of this feature. There aren’t many photos of the Glamorganshire Canal on Flickr at all, and the few that I’ve found really belong with my upcoming shoot of the Local Nature Reserve section of the canal. But I did manage to find a couple of shots that seemed appropriate to today’s shoot, especially welshlady’s shot of Castle Coch taken from the Iron Bridge, which looks nicer than my attempt at the same shot today. Closer look … (at Castle Coch) by welshlady.